This programme provides a thorough theoretical grounding and research-driven training relevant to clinical psychology. The programme is designed in view of the advances in Clinical Psychology, a discipline addressing behavioural and mental health issues including intellectual, emotional, psychological, social and behavioural maladjustments. 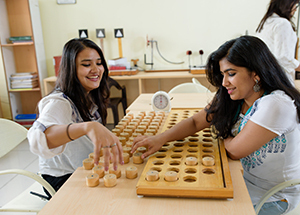 Programme seeks to deliver a thorough and holistic understanding of psychological functioning at the individual and social levels. Upon completion of Master of Science degree in Psychology (Clinical), a student will be able to work as practitioner/ therapist/ counsellor across different types of organizations/ hospitals. For admission to M.Sc. – Psychology (Clinical) programme, candidate must have passed Bachelor degree examination in any discipline from a recognised university with: a minimum of 50% marks (45% in case of SC/ST/PH students); and with Psychology as one of the optional subject at Bachelor degree level. 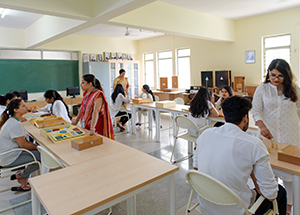 Psychology laboratory in CMR University is well equipped with all kinds of psychological testing and assessments. 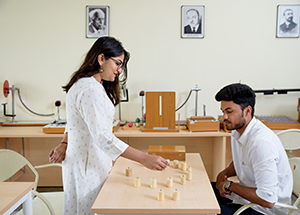 It has all the apparatus based experiments and the paper pencil assessment in psychometric testing for undergraduate level as well as post graduate level for clinical and HRDM specialization. It includes a massive number of 68 experiments along with assessments and apparatus based testing encompassing a huge array of psychometric assessments which opens a whole new domain for students who wish to pursue a career in psychology and forms the foundation for the path to being well learned practicing psychologists.Practical experience during graduate study is important for many reasons. It provides an opportunity to apply gained knowledge in the classroom in real world setting. The psychology lab has well ventilated seating arrangement for students and all the facilities to urge them for a better experience on the platform provided by the university, with experiments ranging from assessing ones mental and cognitive skills, to addressing serious clinical issues like depression and other mental disorders with availability of Becks depression inventory and intelligence tests providing a vast array of tests that are very rarly provided in colleges like Binetkamat intelligence test kit and Weschlers intelligence scale. To add to the magnanimity there are personality testing and the widely popular projective tests like Rorschach and Thematic Apperception Test.